February 22, 2010 a large group of Huichols, or Wixárika as they call themselves, were harassed by police while they were gathered at the sacred place they call Wirikuta, conducting an ancient ritual that, to them, ensures the well being of not only their own community but of the entire universe. According to a bulletin released by the Asociación Jaliscense en Apoyo de Grupos Indígenas (AJAGI), the police treated the Wixárika gathering with disrespect - they broke up the ceremony with rifles, handled sacred objects and offerings, crossed a ceremonial line that shouldn’t be crossed, accused a mara'kame (shaman) for cocaine use, and showed various other types of abusive behavior. The police counted the number of peyote buttons collected by the pilgrims and accused them for being in violation of the law. 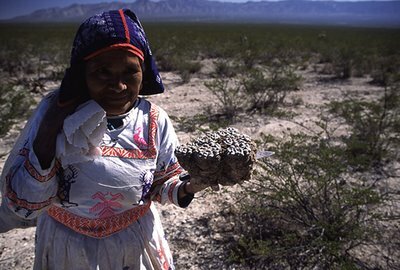 In 2004 a maximum “personal” quota of 100 peyote buttons was introduced, but the Wixárika pilgrims are collecting peyote for the entire community, not just individual use. The police also threatened that the Federal Agency for the Protection of the Environment would sanction and detain the pilgrims, arguing that the peyote had been cut with the root. Harvesting the root might not be the best of harvesting techniques but it has been the practice of the Wixárika for several thousand years. The AJAGI bulletin more than indicates that the real conflict is not as much based on plant conservation issues as on the clash between the traditions and ceremonies of a millennia-old culture and the tireless insisting on “development” by modern society. Today the Huichols’ sacred pilgrimage route is threatened by mines, agro-industry, and manufacturing facilities along with the highways, roads, and electric infrastructure needed to supply these industries. The Huichols are known to fight for their right to the peyote pilgrimage route. In February 2008 a group of 800 Huichols set up an encampment at a highway construction site and remained there for six months. Since then they have filed suit against the government, saying the highway project violates environmental laws as well as their spiritual rights and right to the land. One can only hope that this intricate situation is going to be solved with respect for all involved parties. For reference, please find the full content of the AJAGI bulletin included below. At five pm on February 22, 2010, while a sizable Wixárika contingent from Tuapurie - Santa Catarina Cuexcomatitlán, was in a location named Tanque Valentín, in the ejido (rural land concession) of Las Margaritas, municipality of Catorce in the state of San Luis Potosí, carrying out ceremonies that are part of their millenarian tradition in the sacred region of Wirikuta, four squad cars of state police arrived with an arrogant attitude and began to insult and treat the wixaritari as delinquents, interrupting their ceremony. The sacred circle was broken and Our Grandfather Fire was disrespected by breaking up the large Wixárika gathering with rifles. The harassment continued until 8 pm and took place in a location where the three ceremonial centers of the community of Tuapurie, Las Latas, Pochotita and Tuapurie had gathered in a rare fashion (the latter had left for another sacred point in the desert of Wirikuta just a few hours prior). Each ceremonial center had brought a bus full of Wixárika pilgrims bringing together a large concentration of jicareros (votive bowl carriers). The police manhandled the sacred offerings, the deer antlers, and crossed the ceremonial line that they should not have. They accused one mara'kame (shaman) of ingesting cocaine. They proceeded to count the number of peyote buttons that the pilgrims had gathered, citing an accord signed by governmental agencies that regulates the pilgrimage to Wirikuta, in violation of the communities' traditions and forms of ceremonial operation, in that the pilgrims are representatives of the entire community and not just of one person or family. At that moment, the police threatened to return and did so on Tuesday the 23rd at 2 am, arriving with video and photo cameras once again interrupting the ceremony, the chant of the mara'akame and the words of the sacred Ancestors. On Tuesday, while the emissaries of the ceremonial centers left to place offerings at the sacred site of Leunar (in the Cerro Quemado), the police returned at 9 am and threatened that the PROFEPA (Federal Agency for the Protection of the Environment) would sanction and detain the pilgrims, arguing that the peyote had been cut with the root; a practice that has occurred for the past 3 thousand years. This aggression in itself is an attack against the Wixárika people, and particularly for those from Tuapurie since the assault was against all three ceremonial centers of this community, that are in charge of the wellbeing not just of their territory but of the entire universe. The harassment occurred just a few hours after personnel from the Commission for the Development of Indigenous People (CDI for its Spanish acronym) of the state of San Luis Potosí left the site of the ceremony. It makes no sense that the PROFEPA, as a branch of the SEMARNAT (Secretary of the Environment and Natural Resources), harasses Tuapurie under environmental pretexts and norms which do not fall under the jurisdiction of the state police. 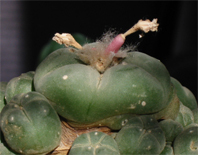 This, while the extraction of peyote at the hands of drug traffickers is heightened and important regions of biodiversity are destroyed by multinational agro­industrial operations. We cannot lose site of the fact that, since February of 2008, the community of Tuapurie has been resisting the imposition of the Bolaños­Huejuquilla paved road which has been stalled by strong mobilizations that have led the community to have diverse jurisdictional proceedings pertaining to environmental, penal and agrarian rights. Among these is the injunction that stalled this mega project at a crucial moment after the Secretary of Urban Development (SEDEUR for its Spanish acronym) argued that it had 400 signatures from the community members in favor of the road construction. In the court injunction, the SEDEUR presented simple copies of said signatures on February 8, 2008 pointing out that the PROFEPA held the originals. The community proceeded to ask said agency to physically present the originals, the request was denied. In reality these signatures did not exist since the assembly and supposed act of assembly were falsified. In the case that these signatures are presented, the signatures should be ruled false and if genuine it should be ruled that they were gathered by a government agency in an illegitimate manner. This situation unmasks the delinquent actions of both the federal and state level governments; furthermore this serious fraud was directly mediated by the CDI, the federal entity that proclaims to serve indigenous people. The tension of the situation has only increased at the announcement by the state of Jalisco that the road would be completed before 2012 and by the decision by the general communal assembly of Tuapurie that the road will not be allowed to cross communal land, thus manifesting the same stance that they held when the tensions began in February 2008. Legal accords exist, based on biological, ecological, socio­economic and anthropological studies and the number of goats, cattle and horses owned by the regions ejidatarios (members of rural land concessions) counted in the sacred land of Wirikuta. These studies that have cost sizable amounts of public money, have led to the decree that rules the area an Ecological and Cultural Reserve which does not recognize the ancient relations between the desert and its inhabitants with the Wixárika people and their right to pilgrimage. This is in direct violation of the International Labor Organization's Convention 169 on indigenous and tribal peoples regarding psychotropic plants for ceremonial use, a supreme law in our country under the 2nd Article of the Mexican Constitution, and under the 9th Article of the State Constitution of San Luis Potosí. All the laws of management under the Ecological and Cultural Reserve are based on the imposition of laws that pretend to regulate the ancestral Wixárika pilgrimage, a process that has continued alongside the imposition of neo­liberal political economic ordinances. In June of 2004, the municipal headquarters of Estación Catorce, San Luis Potosí in the presence of the CDI, the state of San Luis Potosí's Secretary of Ecological and Environmental Management, the State Agency for Attention to Indigenous Peoples, the Commission for Indigenous Matters of the state's congress, and the State Attorney for Indigenous Matters of Jalisco established a maximum quota for personal extraction of 100 peyote buttons. It was also ruled that "security, municipal and state authorities must be notified of annual definitive extraction" and that an annual calendar of visits be elaborated. It is worth mentioning that that same year the assembly of Tuapurie rejected the aforementioned accords. This is all done under the auspices of preventing the excessive extraction of peyote and to "protect the species" leading to the situation in which Tuapurie finds itself today. On the other hand, there exists an unprecedented pressure for the installation of large tomato farms belonging to the wealthy landowners of Cedral, San Luis Potosí (close to the state's governor) who bought 400 hectares of land from the Ejido Estación Catorce, parceled by the Program for the Certification of Ejido Rights (PROCEDE) to 15 ejidatarios for the installation of tomato agro­industry, Clearing a region that measures 5 kilometers by 3 kilometers and that is located in an area of high endemic biodiversity with large quantities of peyote. This company dug deep wells, drying them by square kilometers, they have also detonated explosives into the air to disperse clouds in the region and prevent rain to protect the tomatoes, affecting thousands of peyote buttons. Is this the environmental protection that the PROFEPA refers to? Is it the state police's duty to protect the National Commission for the Protection of Natural Areas (CONANP for its Spanish acronym)? The State Plan for Urban Development of San Luis Potosi (2000-2020) intends to build highways, roads, and electric infrastructure to supply manufacturing facilities, mines and agro­industry in every municipality located along the sacred pilgrimage route. The situation is delicate and the Wixárika people need for the general civil society and human rights organizations to be vigilant of the developments relevant to this traditional pilgrimage, as well as to the harassment that has systematically occurred against Tuapurie since February of 2008. THANK YOU SO MUCH FOR POSTING THIS, THIS DESERVES MUCH WIDER ATTENTION!!! This happened in Mexico correct? Yes, according to the AJAGI bulletin the incident took place at a location named Tanque Valentín, in the ejido (rural land concession) of Las Margaritas, municipality of Catorce in the state of San Luis Potosí, Mexico. In the State of San Luis Potosí, Mexico? "Las margaritas es un lugar, entre los suenos y la realidad, Un tren te acerca a ellas, al venado y las estrellas, al aguila y al alacran, al coyote y a la liebre, a lo rojo y lo verde, a su tierra y a su gente. A su lado el Quemado, a lo lejos el espejo, hacia adentro el reflejo, mis hermanos en la frente".